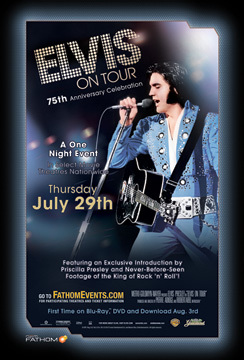 On July 29th the new 2010 version of 'Elvis on Tour' was screened as a special cinema presentation in 467 movie theaters in the USA. The night held promise that Elvis fans would be delighted with the award-winning 1972 footage as well as "never-before-seen Elvis tour scenes, montage sequences produced by Martin Scorsese, and a specially-produced, exclusive retrospective from Priscilla Presley". Screening was throughout the US, everywhere from New York to Seattle. EIN's US readers report back on the positive and negative experiences of being at this special event. 'Elvis On Tour' - A personal review from a New York suburban cinema. - Greg Nolan Jr reports. I had bought the tickets on-line in advance, thinking there's no way anyone else is showing up in this East Coast American suburb...but you never know. After all, there's no mention of "Elvis on Tour" on the building outside...nor inside, save for a promo clip shown on TV screens. A jaded ticket taker waved us toward theatre #13, as if he'd been saying it all night. That was a first clue. I entered the theater and sure enough it was 75-80% full, some 100 plus people, of all ages. Could I have stumbled into the wrong movie? All these people are here to see an Elvis movie? Wow! I wanted to shout "hello, people, hello Elvis fans!" but kept my usually cool demeanour. I was beside myself at how the night was going so far. 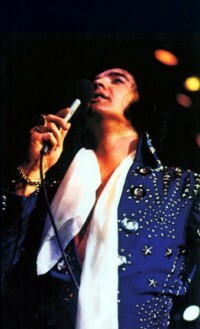 Some of the pre-movie Elvis promotions began, hawking the "75" box-set; the Vegas "Viva Elvis" show; the "Viva Elvis" album itself; and then Graceland as well as the "Elvis On Tour" DVD / Blu-Ray. A bit excessive but I couldn't help smiling to myself that we are definitely in the right place. I was favorably impressed with the mini-making of EOT film preceding it. From the controversy over the apparent "Johnny B. Goode" exclusion on the DVD, I had assumed Warner and EPE had in general not done a thing to put EOT in context historically, let alone put a very thoughtful short together on it. To my surprise, insightful interviews with Jerry Schillling and Andrew Solt and others were included, talking about the historic value of the film, even showing a snip of the "Woodstock" film and showing how this was an equivalent for Elvis, and arguing that in many ways it was the first true behind-the-scenes documentary of a major pop / rock star on the road. There was a nice piece about the involvement of a young Martin Scorcese, which I thought had to be mentioned and they did it just right without over-selling what was a very limited but interesting contribution. There was discussion that made us appreciate the less-structured, multiple-camera approach and how the multi-screen was a tough but rewarding process, allowing a true "you are there" feeling for the viewer - in the theater, as I finally discovered. It was great to see the late producer and director Robert Abel and Pierre Adidge mentioned with some keen insights into what they were trying to accomplish...ironically in a discussion about the very beginning voice-over with Elvis that originally led into "Johnny B. Goode." They also noted the great highly-personal interview that mostly did not make the movie..although they played a key snippet. Fascinating stuff but over too soon. From this discussion, you'd never know that according to Warner, ol Chuck Berry and publisher never returned phone calls about clearing the copyrights to the original opener. Oh well. It did begin to drag on just a bit too much, with quite a few "teasers" of what felt like each song, and overtime, Priscilla Presley annoying presented as the "Founder of Elvis Presley Enterprises" - might that truly have been your late, ex-husband himself?! I was waiting, in effect, for people to tire of the talking heads and snippets as people would react to Elvis...and then realized it was still the little preview movie...before the actual movie. But there she was again, Priscilla Presley with one last somewhat indulgent tacked-on interlude, with a not-too-flattering angle, even repeating something that seemed to imply that "Bridge Over Troubled Water" was sort of a message to her, and that it blew her away, etc. "Puh-leeze", I thought, but knew it was ready to begin. I had thought I had dropped by a screening of "Elvis By the Presleys" as that whispery voice was truly grating on my patience. She closed with a too-obvious plug that we come down to Graceland again real soon. All told, an excellent warm-up but start the movie already! Then, the movie began - ELVIS ON TOUR. I truly braced myself and yes, chuckled at the absurdity of it all. After all, the "making of" film itself had even discussed the great opener. I saw the MGM lion, I saw some movie title texts I gulped and then saw the '30s shot of E and parents and the cool commentary...and held my breath. They wouldn't would they...? Instead of blazing Berry-fied guitar, I hear the familiar but somehow less rock'n'roll strains of "Don't Be Cruel," and a '70s rip-through at that. I wondered if I might hear a local hard-core fane heckle the screen (which I'd second) but we all stayed silent. I actually turned and glanced at this point to my fellow movie lovers but there was no "rebel yell" to be heard. People were digging it and non-the-wiser, apparently! Elvis was back on the screen! People laughed at the "before I kick..." along with the visual, while I heard it loop through again (it was a short medley as you'll recall) but was immediately wowed by the incredible visuals of the Big E gallivanting across the screen. There was to me great sound (nice definition) and a revved up, pro-Elvis crowd that had come out on a hot and muggy Thursday of all days to see a 38-year old film, a documentary, no less. I smiled at myself thinking of the self-proclaimed "Pop King" and the high-caliber legend, Michael Jackson - Would his flock be turning out in 2047 to see one last concert film? I knew this would not be happening. There was a quiet enthusiasm in the crowd I could tell folks were serious about Elvis and not at all going to talk through the film, leave early or go to the bathroom. It looked incredible for the most part. It probably looked more like a really mint copy of the original but then I wasn't expecting it to be better than it was. It was clearly restored in my view. I don't have a "Blu-Ray" yet but I was on Cloud 9. This was a true and all-too rare "Elvis Experience" and particularly for my better half, who noticeably was uncharacteristically stuck to her seat with pure interest. Interestingly (this being the first real experience for me to see Elvis in the cinema outside of a summer outdoors series in 1982 that showed "Paradise Hawaiian-Style") , the Elvis fans (that is, seemingly all who attended) laughed heartily at the freight elevator operator scene, finding the shy, non-talkative old man a charming if odd diversion. I always thought there was some humor there - even though most today seem to hate it - but it was reassuring that such inclusions were meant to give the lay of the land, the mundane, the thrilling, the vital, and the tacky, all of it. Both the old man and the more embarrassing fans seemed to cause annoyance. There were a few grannies in the actual film (one showing up oh-so seriously to see the show) and another looking with scorn at the antics of a out-of-control younger female, which was greeted with hoots and laughter. That over-elated red-bandana fan girl especially grates but the crowd seemed to enjoy her and all the unabashed enthusiasm for Elvis. I think a lot of them remember being that girl...or feel they would have acted that way. Normally such scenes are annoying to me but the vibrant reaction from the movie crowd was a sight to see. The "Love Me Tender" scene was great to see again with all the '60s Elvis movie clips included in and looking so well-upgraded. 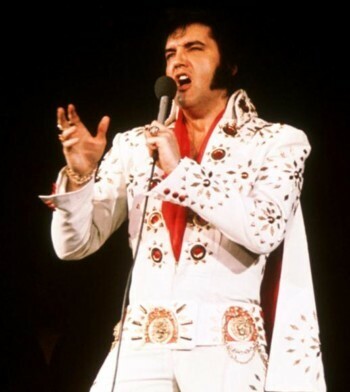 And every time Elvis cracked wise about this or that, a crazy fan or a bumbling politician who found his way onto Elvis' plane, the fans in the theater totally enjoyed his humor, reminding me how much this element was part of his legacy, as President Carter of all people noted during his passing. At times it felt like we were at a real concert as the film looked very good, particularly from one wide screen angle that almost fooled your eyes into thinking he was right there. I used to find the multi-screen annoying but I now know it was truly designed for a big screen. The volume was fine (although there have been complaints at other cinemas). As I later learned, the especially low bass notes, such as from you guessed it J.D. Sumner apparently got little Junior to a-kicking throughout, showing off to my expectant partner sitting beside me! I did see some kids under 13 perhaps with their father, but I saw a healthy sprinkling of people in their 30s and 40s but mostly a good deal of 50-somethings and some older than that, including a couple in wheelchairs, many donning Elvis t-shirts as I later saw, including a "Speedway" one that made me chuckle. Seeing this all "in real life" was quite pleasing. It was a real slice of America. Having not joined an Elvis fan club, I first thought they were random people - with no real publicity, how could they be here? - but it was clear their hero was back in town and they wouldn't miss it. A feeling of solidarity and communal enjoyment came over me this night. I realized how with the passing of the time, all the people in that room really should get to know each other more, as those Elvis fans we once knew or had introductions from are too often taken from us at young ages , often involving illness. There was some actual groans when the strains of "Can't Help Falling In Love" began as they didn't want him to go, that is, the movie to end. To my total surprise, it ends, shows him in the tunnel to his car, and then "Memories" begins during the screen title crawl. Amazingly, no one is getting up to leave yet! So it ends, and that great shot of Elvis looking out the window is shown - which was thoughtfully discussed in the "making of" short - and then I hear a some kind of hoot or "Alright! "...all the people began applauding , quite loudly too! What a real treat that was. I heard someone say kind of loud "show some more, we'll watch it..!" People smiled and laughed and I actually felt the subtle tug of water in my eyes. Elvis could still move people, 38 years later and through technology and a keen sense of fine memories.. A vibe of good feelings came across as I realized I was with a unique but also common bunch - the very regular folks who made Elvis such a legend. They never really turned up the lights too brightly inside but I began listening in and then observed the crowd in the hallways heading to the restrooms and exits. Lots of smiles and small gatherings could be seen. I was hearing people talking about having actually seeing him "in '72 in this or that suit" and "in "77" when he was in this or that local town.."
I think it was a great experience and I hope whatever shortcomings exist, like the opening butchery, that most of you get the chance to see this jewel lighten up the lives of fans who still can't get enough. Having only the memory and prayers for the souls of the now-deceased Elvis fans in my family (one of my brothers, mother and to some extent my father), I felt a pull toward the movie because Elvis was someone who moved them and here he was, in effect doing it again. They can no longer see it with me but to make a family connection and remember their own would-be enthusiasm for this night brought a poignant sense of melancholy to me. The end of this road may indeed be drawing fast (demographics can't be on our side) but to me, this evening (the Chuck Berry editing flap and allegations of lower-than-expected fidelity and not enough rare inclusions) was taken as a real gift. Overall it was a wonderful night out with Elvis at the cinema and from the more positive reactions, I know I'm not alone in saying it was a terrific experience. "Elvis On Tour" in 2010 on the big screen is a total delight. - Greg Nolan Jr - for ElvisInfoNet. Other fans however did not have a good experience . . . I just came back from seeing this movie and very disappointed, I have the previous release of Elvis on Tour made and this one is the same thing, nothing new added, except for the director's talking, Priscilla talking and Schilling talking about Elvis saying what kind of performer he was and why he was different etcetera, etcetera, things we all knew about. The crowd was pretty large in the big theater and it was more than half full. The audience weren't particularly excited, they looked as if they were expecting more. The picture quality as was ok, with the video moving too much at times and with the same three-screens version that we all know. Nothing new. Just the same as the one I already have. The sound however was very good. Of course most keen Elvis fans knew that Johnny B Goode would be missing at the start but and I heard some comments from other fans about that and they were disappointed. 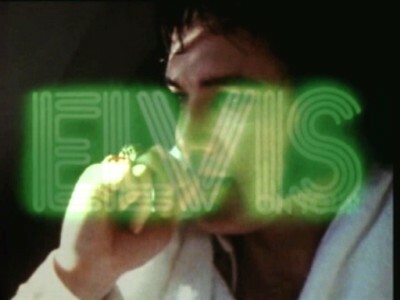 And to top it all there no extras after the film, just an end with the image of Elvis after a concert in his limo looking throughout the window and submerged in his thoughts, and the long list of usually name of producers, etc. Personally I felt that they wasted a lot of time at the beginning before starting the movie with "Making Of' and too many words from the director, Schilling, Priscilla of course, lots of talking about Elvis and showing brief moments of his life since his beginnings but just shots. Where was the promised "Unseen Footage"? As far as I am concerned it was a total disappointment because I have the original one and this one has nothing new. What else could I say? In fact I am sorry I ordered the new 2010 DVD, because I already have the same one. I saw the re-release of Elvis On Tour in Woodridge, IL about 45 minutes west of Chicago and was generally disappointed. The opening introduction was of little insight for any fan besides a newbie and offered zero new footage. The actual film itself was nothing new and actually shortened by removing a few scenes and vignettes. Essentially they cleaned up the film by taking out a few sexual comments and an interview with a venue promoter- and that's about it. Again there was zero new content and to make matters even more disappointing the sound was hushed. It was neither in stereo nor surround- and seemed to be a single channel behind the screen. Many people complained to the building manager and she was unable to improve it. For a concert film experience it was sad and my home stereo system offers a better listening experience. It was interesting to see Elvis on such a grand scale, don't get me wrong, but they didn't do the King justice. My gut says this is an EPE hype tool to warm the audiences into buying their new product and little else. disappointing is that the releases from the "Elvis Lost Performances" were not included. There were classics like All Shook Up, Teddy Bear/Don't be Cruel, Are you Lonesome tonight, I cant Stop loving you and the How great tho art. All of these classics were left out on the original on tour and now the 2010 version. I just expected more. Well the unseen footage turned out to be a "making of EOT". Absolutely nothing new just Pris, Jerry and Andrew Solt talking about the movie. The theatre was packed and the evening started with Elvis trivia on the screen with some nice photos of EP on stage. The one interesting quote came from Andrew Solt "The outtakes are very interesting" Guess we will never know. Thinking back on it why did we believe there would unseen footage when they couldn't put any on the DVD? The sound in the making of EOT was great as they used snippets from the film; The quality of the film I think was better but that quickly changed when the movie started. A blurb came up about maintaining the original aspect ratio and it was formatted to fit the screen, which meant they only used about 60 percent of the huge screen. I saw and heard no improvement at all in the picture and sound during the movie. Beforehand there was a long commercial. They did a 75th anniversary commercial advertising about everything including the 4 cd 75th boxset, Graceland, Viva Elvis, the Elvis Cruise and even the Viva Elvis cd. I really didn't expect any unseen footage but I did expect the movie to be in HD quality but I was wrong. It was very disappointing. I hope and pray the BluRay Disc will be much better. More positive experiences . . .
Justin S adds his report for EIN from this special screening. I couldn't pass up an opportunity to see Elvis on Tour on the big screen regardless of opening credits. It was a great evening. The room was practically sold out..99% full. People of all ages.lot of older crowds but also a good majority of twenty and thirty something folks. Very cool to see some "cool LA" folks also digging E.
We had quite a bit of VIPs in attendance, Jerry Schilling, the entire Beaulieu family, and 2 execs from Warners. Jerry came up, mic in hand and introduced the film saying a few words about his involvement with the film and a few words about Elvis. Everyone in the room knew who Jerry was as we all applauded when he got up to speak. It was then I began to feel the real bond as Elvis fans amongst all of us. It was a slice of a Graceland crowd right in LA and I was digging it. Very rare to be amongst that many Elvis fans in one room---on the same wavelength. It was exactly what I had wanted out of the evening. The film starts and - like many fans that know Johnny B.Goode would be missing - I sat with my head down and eyes up....waiting, cringing at what would come on during the credits. And there it was.....that oh so horrid opener. Right as "See See Rider' started...it noticed how painfully low the volume was. It was a terrible way to start the film, though. I was really looking forward to hearing "See See Rider" blast through now that JBG was taken away from me as what was supposed to be my first jolt of the movie. I thought, Dear God, I'm getting up to tell someone if it's not fixed soon. Thankfully the volume was corrected after "See See Rider" as someone bolted out of their seat and most likely told management to raise that volume. It was so quiet....and terribly awkward. Volume was corrected by "Polk Salad Annie." But still not as loud as I would have wanted. It was so great to watch the film with a huge crowd. After "Polk" the film received its first round of applause. In fact, nearly every song in the film received a hand after it was done. It's funny....you start to realize that your favorite parts of the film or even song---are also favorites for other fans. People went nuts during that long drum roll Ronnie does during the middle break at "Proud Mary." That was always a cool part for me...and I was amused that the rest of the crowd also liked it just as much. The film was great...people laughing (the old guy explaining the elevators), singing along ("Burning Love" and cheering (after "An American Trilogy.") Caught Jerry Schilling as I was exiting the bathroom as he was going in. We exchanged pleasantries, he asked if I was enjoying the film...told him it was good to FINALLY get it. He agreed. After the film, while exiting my row I caught one of the Warner execs that was introduced earlier. I asked her point blank: "so what happened to that opening?" She sighed and said under her breath "A lot of people have been asking about that." She bit her tongue and proceeded to explain to me the same stuff we've read ...."we tried to contact Chuck Berry.....no response. We chose a song to replace it to be representative of Elvis during that time. It was a tough choice to make....we had no choice." She said. Not wanting to damper the mood I moved on asking her if we'd ever see a box set of the film reminding her how much extra footage existed she said "Maybe one day." I told her that if they put one together---we'd buy it. She was pleased to hear that. Before I left, I chit-chatted a bit with Mr. and Mrs. Beaulieu. I kidded them saying that thanks to the "Elvis by the Presley's" DVD--they were very recognizable to any Elvis fan now. They were very kind and gracious....they introduced me to the rest of the family there: Phil, Priscilla's brother and Michelle, Priscilla's sister along with their other friends. It was obviously a great night for them and they were very happy to be there. 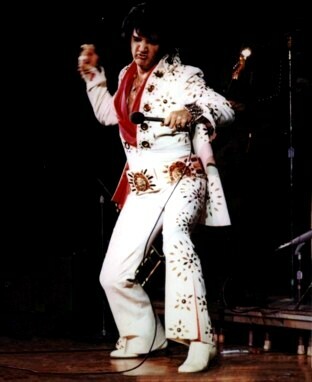 Funny enough, Mr. Beaulieu mentioned that he had never seen "Elvis On Tour' before---this being his first time! He was elated to have seen it. He kept saying how much he enjoyed it and how great Elvis was. Jerry was very nice and talked to everyone that came up to him. All and all...it was a great evening. Nice to see live Elvis on the big screen with a crowd....doesn't happen often these days. Marty Lacker adds his comment for EIN. The first thought that came to my mind is that once again, all "Beaulieus" and no Presleys and Smiths. You know, once again, Elvis' real flesh & blood family are not there. It was a repeat of "Elvis By the Presleys" which was really "Elvis By The Beaulieus." Cousin Billy Smith was Elvis' closest friend and flesh & blood right to the very sad ending - Where was he at these celebrations of his cousin's life? Someday the majority of the fans need to say something about Priscilla in that perspective. They need to let her know that it's not about her or her family. This is supposed to be all about Elvis and that's the way it should always be." I saw EOT in Northern California and thought it was great seeing our man back on the "Big" Screen doing what he did best! It was AWESOME! With virtually NO advertising the theater was still 1/2 full. Capacity was 207. The first 20 minutes of the film with Jerry Schilling, Priscilla, etc: the sound was FANTASTIC! Then when the original movie started there was a huge drop off in the sound. 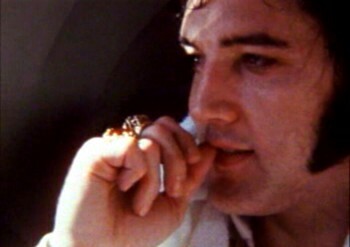 When Elvis was singing "Separate Ways" it was almost impossible to understand what he was singing the volume was so low! I thought the picture quality was great! The audience clapped at the end and all stayed for the last credits. Great evening!! Now I can't wait for the Blu-ray! I had to see "Elvis on Tour" because there were blank spots after joining the original Elvis Presley Fan Club in 1956, when I was in seventh grade. (still have the heart shaped emblem with "My heart belongs to Elvis" in red velvet) Of course those were his "gorgeous" years, and his later "helmet hair" era was not as attractive to me. Besides I joined a convent in 1962-1969, so I'm always in the business of filling in those aforementioned blank years. You may be sure there was no pipeing in of "You Ain't Nothing but a Hound Dog", in the halls of the novitiate! (LOL) So seeing this film was almost like seeing Elvis for the first time; and we all know how great "the first time is". Enough said. I enjoyed every minute of it!. I was at the showing and really loved seeing Elvis live on the big screen. There wasn't the new footage promised but it was so good to be in a theater with all the fans. I will watch it tonight on TCM and have my DVD preordered. I was not disappointed and enjoyed the preview at the beginning with Priscilla and Jerry Schilling. Elvis On Tour - in NYC. I went in NYC and the crowd was a mix between young and old, I was surprised that their were as many people there being that it was in Manhattan. Everyone was clapping after every number. There were tears. I loved it. It was my first time seeing Elvis on the big screen so I just loved it! 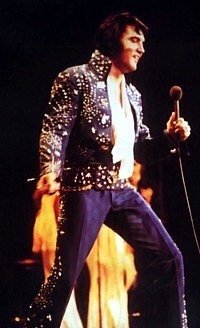 I have the original so I had no expectations other than celebrating Elvis for the great entertainer he was/is. Elvis On Tour - in Danville, Virginia. My sister and I attended in Danville, Virginia. We both laughed, cheered, and cried. I found myself tearing up several times. The movie brought back so many memories from our childhood spent in Rockingham County, North Carolina during the late 1960's and early 1970's. Both our parents were huge Elvis fans, and they actually got to see him in Greensboro in 1975. It was great to see him performing in Greensboro in 1972 as well as at Hampton Roads because my paternal grandmother lived in Virginia Beach at that time. What struck us most was at the end of the movie. Not one person left the theatre until all the closing credits were over. It was as if they wanted to savor the experience or they were waiting to be told that Elvis had left the building. Then my sister started to clap to the blank screen and everyone else started to clap as well. There had been several other rounds of applause during the film. I for one enjoyed the experience very much but left a little sad and a lot sentimental. I reflected to myself that Elvis Presley truly was a once in a lifetime entertainer, and there will never be any other like him in my lifetime. Unfortunately, these days everything has to be so politically correct I fear he will not be given the credit he is due because he is a white male, and I think that is sad because it distorts history. A lovely detailed review from Tampa Florida. My wife and I attended the showing of "Elvis On Tour" last night at the Citrus Park Mall in Tampa, FL. I was told by one of the theater employees that the show was sold out completely, which was amazing, considering there was really no publicity for it here—not even a poster in the lobby. We arrived around 6pm and grabbed good seats in the middle of the theater. By show time at 7pm, the theater was about 85% full. The majority of folks that attended were probably between 40-70 years old, but there were also young grandchildren there, and even a few young adults too! We met a woman visiting from Texas that had her 2 grandchildren in tow. She was decked out in her Elvis shirt, charm bracelet, purse, and cell phone. She told us she once had tickets to see Elvis at the 1976 Pittsburgh New Year’s Eve show, but due to uncontrollable circumstances, did not get to attend. She comforted herself with the thought that she would see him the next time he came to town (sadly, it was never to be). But she has her tickets framed at home. 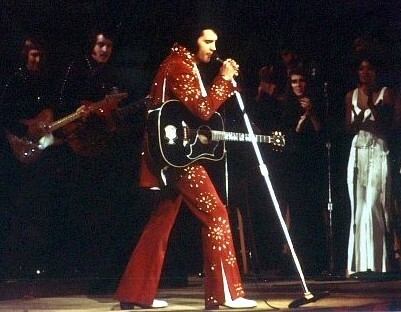 My wife had never seen “Elvis On Tour,” so she was looking forward to it. I had never seen an Elvis film in a theater, so my hopes were high as well. The movie started with a “making of” feature, with Jerry Schilling, Andrew Solt, and others and commentary by Priscilla Presley. Yes, there were a few clips with unreleased rehearsal footage in good quality, but nothing earth shattering. It seemed that the volume for this segment was nice and loud, raising our expectations for the main even to follow. Then the movie started, with “Don’t Be Cruel” instead of “Johnny B Goode” for the opening. Not that bad of a substitution (in my opinion), and my wife never knew the difference, since she had never seen the film previously. Then, the rest of the movie pretty much was as we have seen on the VHS version. The movie, with all of the split-screen effects definitely works well on the big screen, and I noticed things this time watching, that I had not previously the many other times I had seen it at home on video. The audience clapped and cheered repeatedly after various performances, such as “Polk Salad Annie,” “Bridge Over Troubled Water,” and “American Trilogy.” By “Can’t Help Falling In Love” at the end of the film, everyone was clapping and cheering, some yelling “Encore!” and “We want more!” But everyone stayed right through “Memories” until the screen went dark. It seemed all present truly enjoyed the event. My wife said that since she never got to see him in concert, she wanted to “feel” the music, and was looking forward to a full-volume surround sound full concert experience. However, though volume of the “making of” feature was rather loud, oddly, the volume of film itself was not that loud at all and the surround sound was rather soft and low. We both were somewhat disappointed in the sound, and my wife said she did not get to “feel” the music, like she was hoping to. Nevertheless, we both enjoyed seeing “Elvis On Tour” in the theater, surrounded by Elvis fans of all ages with one common love for Elvis. I was amazed at the great turnout for this event, which was not publicized at all. Yet, people still came out to see their hero on the big screen, in one the one of the best film presentations of the true Elvis concert experience. Those of us who never got to see him in concert were treated to the next best thing. 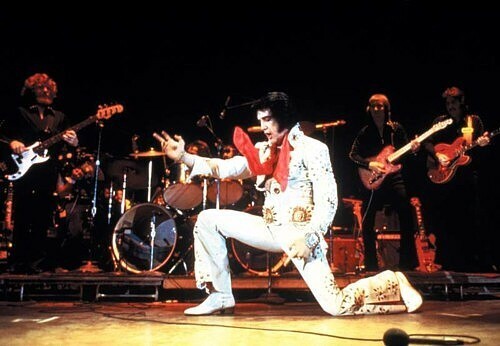 I am glad that “Elvis On Tour” was shown for one night for all to appreciate once again, and is to finally be released on DVD for all to enjoy. However, I do hope that one day a deluxe version with outtakes and additional footage will be released, with the opening song restored as originally presented. Totally enjoyed the Experience of seeing Elvis on the big screen. Theater was packed mostly over 40 crowd. I went only to see Elvis on the big screen plus the film makers & priscilla discuss Elvis on tour. I've owned the outtakes & extra footage from bootlegs for years so I wasn't expecting anything NEW. Johnnny B Good missing so what? It really is chuck berrys song. 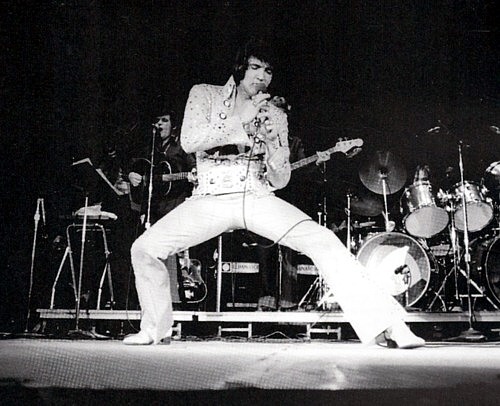 Elvis covered it really better then Chuck. You have to consider the whole picture. When That's the way it is was released and updated it was so much better without all the fans comments. I have always skipped over that part it had to go. Elvis on Tour had very little of that. Pure Elvis. I've seen three versions of that's the way it is come to DVD. 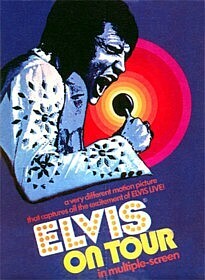 This won't be the last Elvis on tour on dvd the extra footage will come the market for it has to be there. People in my theater clapped at the end everyone was entertained and then-some. The man behind me remarked to who he was with. "Best film I've seen in the theater in years". 30 plus years latter Elvis Presley is holding his own. His legacy music no one can forget. A performer that only comes along once in a lifetime. For a man that thought in his last year alive no one would remember him. I showed up at the theater because I can never forget. Elvis you will always be remembered ! Hey Priscilla let's do it again ! To promote a pre-show feature as having "never before seen footage," and to then offer less than 30 seconds of material, made the Turner and EPE folks worthy of Tom Parker. The introduction served to acquaint those in the theater that aren't as up on Elvis as we are with the film. Priscilla was credited as "Founder of Elvis Presley Enterprises, Inc." Schilling was interviewed on the patio of the Hollywood house Elvis bought him. The introduction was nice and loud, and got me excited to see the film. The movie itself was not nearly loud enough. As for the revised intro, I understand the realities of the situation. But, my God, how could any filmmaker on Earth allow that amateurish music edit to kickoff the digital release of Elvis' final movie? I made better edits my first year in radio, using a blade and a grease pencil. Overall it was nice to see Elvis on a movie theater screen. Funny that the biggest crowd reaction was laughter, at the elderly gentleman opening the doors and the sequence with the mayor. There was soft applause at the end of the film. I went to EOT Thursday night. At my theater the sound was great, very loud and it sounded so good. It was so good to see Elvis on the Big Screen again. I miss him so. I grew up with Elvis. Listening to him on the radio, seeing him in teen magazines and then came Love Me Tender. It was Love at first sound. I have Loved him all my life, since I was 8 years old and I will Love him until I die. It would have been so nice to see the new footage that they promised, but I guess they will bring it out later so they can take more of our money. Of course this is my opinion. To bad for us older folks, I guess. - Maybe I'll see you In Heaven !!! I was at the screening of "Elvis On Tour" Thursday evening, and was totally blown away by so much extra footage that wasn't in the original release of the film. Seeing Elvis up on the big screen again was such a thrill! I was at the Buffalo, NY concert, April 5, 1972 and was so happy to see an abundance of footage from that concert! There were nine of us in our group at the theater, four of whom were at the original show! We enjoyed seeing this wonderful documentary and the younger generation that was with us, from their 20's through their 40's, loved seeing Elvis in the theater. It's something the 20 and 30 year olds never experienced before. 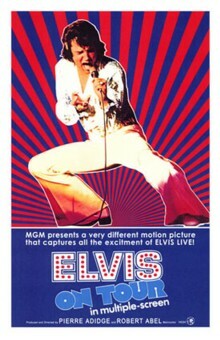 I think one theater in each city that showed this film should consider showing an Elvis film once a month, starting with "Love Me Tender" and going through Elvis full catalog of films! This was such a wonderful treat! I hope that EPE will consider doing this again, and often. Loved seeing Elvis on the big screen. Loved sharing the experience with my two daughters. Saw the movie in southern California where there had been no promotion or advertising and the place was probably filled to a 90% capacity with a diverse group of people. Could have done without Priscilla's self-serving commentary and would have loved to have seen the powers that be make a concerted effort to truly honor Elvis' talent and legacy and restore this film with the quality of sound, color, and clarity that is technologically possible in 2010. In spite of the missed opportunity to give Elvis and his fans a superior product, I was still overjoyed to again see this wonderfully gifted entertainer to what he does better than anyone else! Would love to see the Aloha concert, 68 Comeback, and Elvis:That's The Way It Is made available for a special showing in the near future. 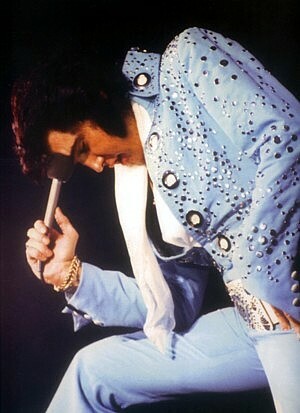 Thank you Elvis for everything!! What can i say amazing!! 33 years gone, and can still pack them in!! blows my mind people cheering and clapping at a video screen, blows my mind. He was and still is the Greatest!!! One thing as everyone else is saying the sound was insane clear during the beginning of The Making then when See See Rider started it was muffled then came back during Proud Mary, then lost and back during the whole event why did this happen? I'm going to write EPE.